Introduction: Internal hernia (IH) after Roux-en-Y Gastric Bypass (RYGB) is an important cause of small bowel obstruction. 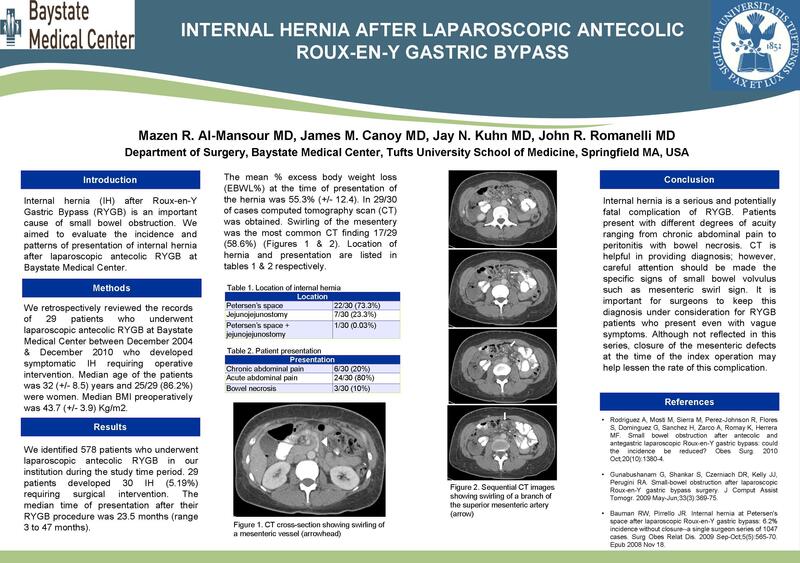 We aimed to evaluate the incidence and patterns of presentation of internal hernia after laparoscopic antecolic RYGB at Baystate Medical Center. Methods: We retrospectively reviewed the records of 29 patients who underwent laparoscopic antecolic RYGB at Baystate Medical Center between December 2004 & December 2010 who developed symptomatic IH requiring operative intervention. Median age of the patients was 32 (+/- 8.5) years and 25/29 (86.2%) were women. Median BMI preoperatively was 43.7 (+/- 3.9) Kg/m2. Results: We identified 578 patients who underwent laparoscopic antecolic RYGB in our institution during the study time period. 29 patients developed 30 IH (5.19%) requiring surgical intervention. The median time of presentation after their RYGB procedure was 23.5 months (range 3 to 47 months). The mean % excess body weight loss (EBWL%) at the time of presentation of the hernia was 55.3% (+/- 12.4). In 22/30 of IH (73.3%) the hernia occurred at Petersen’s space, while in 7/30 IH (23.3%) occured at the jejunojejunostomy and one patient was found to have a hernia at both locations. In 29/30 of cases computed tomography scan (CT) was obtained. Swirling of the mesentery was the most common CT finding 17/29 (58.6%). Patients presented with different degrees of acuity: 6/30 (20%) electively with chronic abdominal pain, 24/30 (80%) presented to the hospital with acute abdominal pain. Bowel necrosis was found in 3/30 (10%). Conclusion: Internal hernia is a serious and potentially fatal complication of RYGB. Patients present with different degrees of acuity ranging from chronic abdominal pain to peritonitis with bowel necrosis. CT is helpful in providing diagnosis; however, careful attention should be made the specific signs of small bowel vovulus such as mesenteric swirl sign. It is important for surgeons to keep this diagnosis under consideration for RYGB patients who present even with vague symptoms. Although not reflected in this series, closure of the mesenteric defects at the time of the index operation may help to lessen the rate of this complication.